Description: SD70M-2 # 8002 passes VIA train 1 one half hour west of Jasper taken from open Dutch door of the observation car.. Description: CN train M31971 (Geismar, LA - Champaign, IL), with CN SD70M-2 8002 as the second motor. 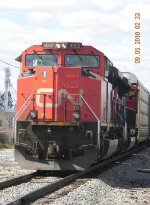 Description: CN 8002 at CN Nichoals Yard. Description: In this view from Main Street, CN 8002 works the yard at Durand, which is full of cars on this Sunday before Labor Day. Description: Southbound manifest enters Harrison Yard behind a pair of SD70M-2's. Description: CN 8002 leads an eastbound through a January snowstowm. Title: CN 8002 East at Mile 5.8 Strathroy Sub.